Tables and chairs are a necessity for most homes these days. This is fine if you have a dining room as there will be plenty of different options available to you. However, if you are low on space, then you will find it much harder to find a tables and chair set that you like. Fortunately, there is a solution. If you take a look online then you will see that there are plenty of space saving tables and chair sets to choose from. In order to make sure that you are making a sensible buying decision, here are a few tips that will help you choose the right set for your dining space. The Material – Choosing the material will depend on a number of different factors. For example, do you want to go for a traditional wooden look, or would you prefer something more modern such as glass and chrome? There are so many beautiful designs out there to choose from. Seating – In order to choose the right type of table and chairs, you are also going to need to think about the amount of people that it is going to need to seat. You should also keep in mind the fact that you might require extra seating, particularly if you regularly entertain guests. Style – There are so many different types of space saving tables and chairs to choose from. If you are very low on space then you might want to look into a breakfast bar type. If you have more space available then you might want to look into getting a fold out table that will give you extra space when required. These are just a couple of the things that you should consider when choosing your table and chairs. Because there are so many different types and designs to choose from, we decided to test and review some of our favourites. Below you will find our top three. Slightly difficult to put together. The top spot on our list had to go to this beautifully designed round table from Wade Logan. 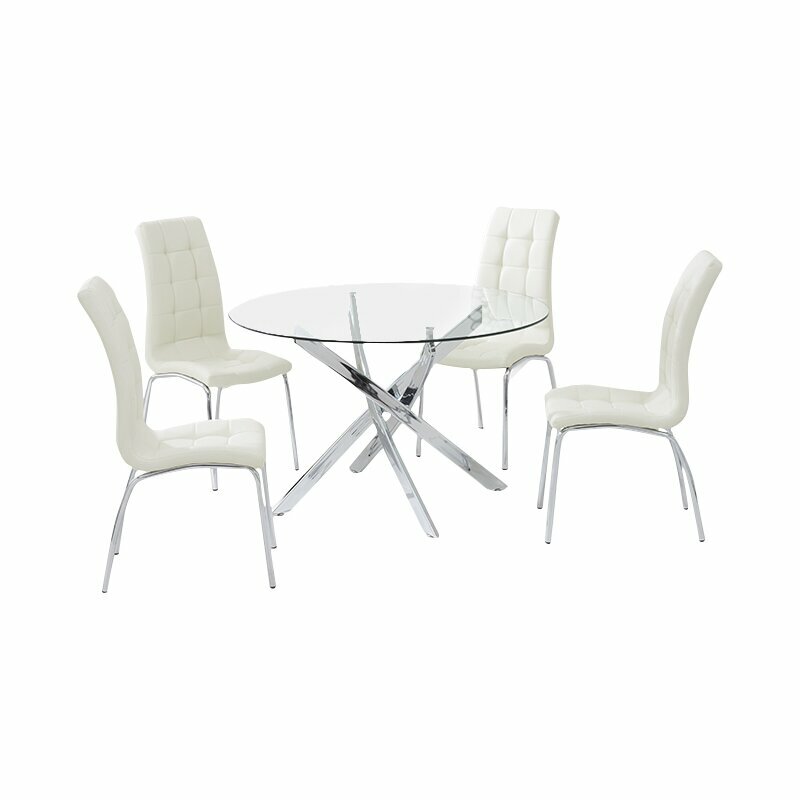 The Dawson Dining Set consists of a lovely round glass table with 4 chairs which have been upholstered in white PU leather. The design of the set looks elegant and modern; perfect for the modern home. One thing that we really liked about the design of this one is the chrome plated metal frame. This looks great in contrast with the clear glass table top and the white imitation leather chairs. This table is plenty big enough for 4 people to sit and eat comfortably without taking up too much space. Cleaning the table top as well as the chairs themselves is very easy indeed; a simple wipe down with a damp cloth and they look as good as new. The only issue that we did have is assembling the table. The instructions were a little difficult to understand. However, with some common sense it is quite straightforward. In terms of comfort, the chairs are very comfortable to sit on and the table is big enough to sit 4 very comfortably without feeling too confined. 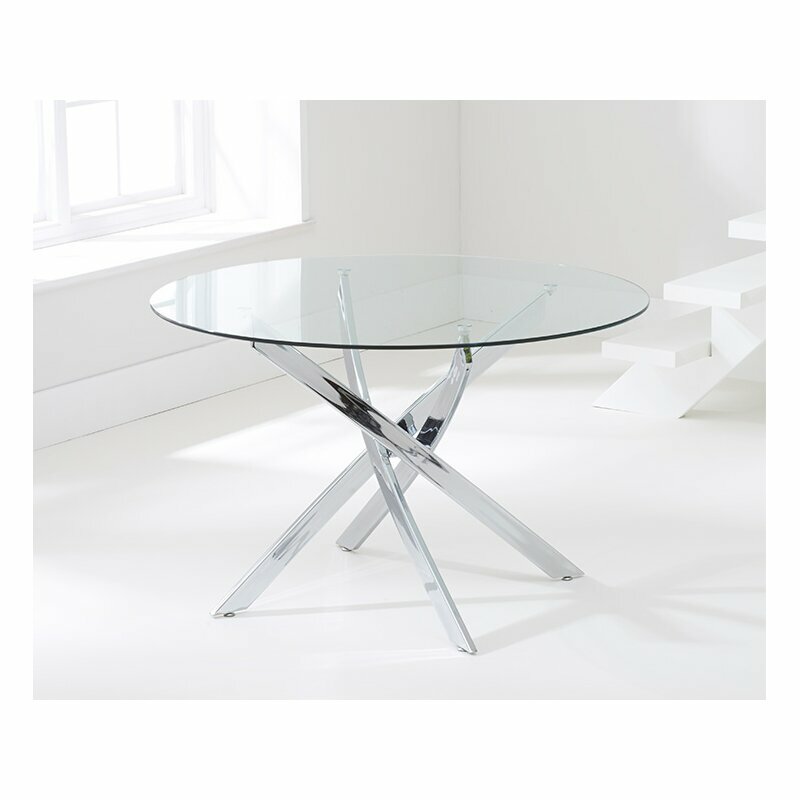 Overall, this is a very well-designed modern table that would look fantastic in any home. Extendable table so ideal for those who entertain regularly. Very lightweight so easy to move around. 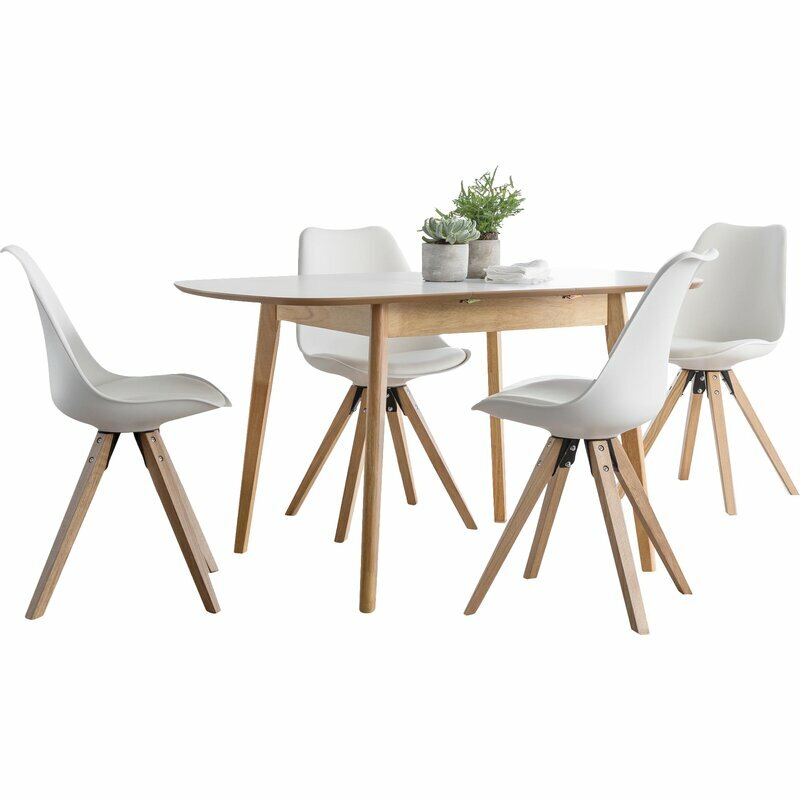 Compact for smaller dining areas. Table top stains quite easily. This elegant rectangular table from Norden Home made our list for a number of reasons. First of all, let’s take a look at the design. 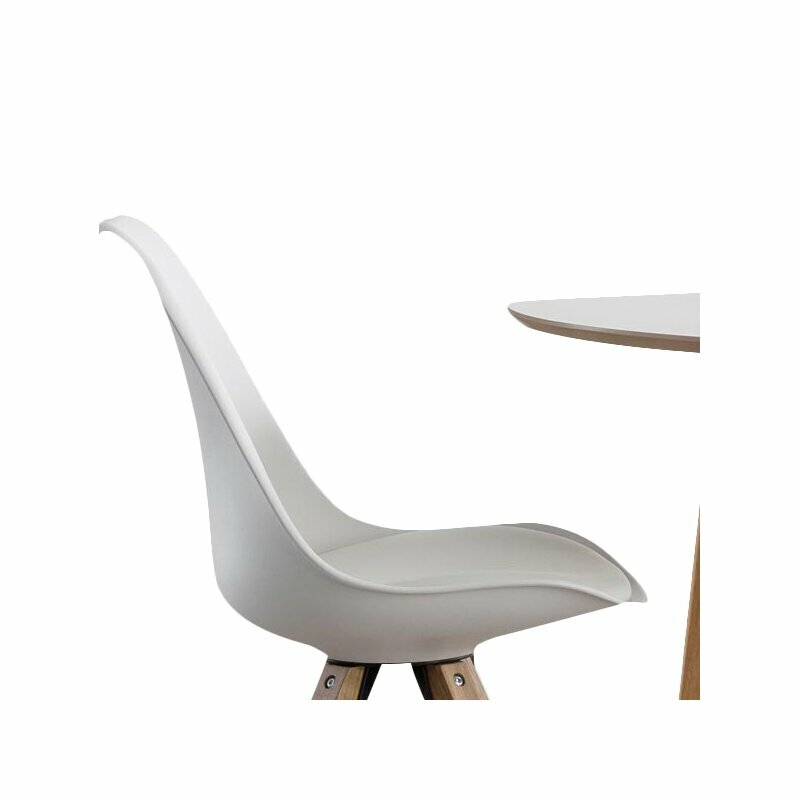 The table top itself is made from oak effect wood with a white plastic finish. The frame and the legs of the chairs are finished in a light oak effect which looks lovely. One of the things that we really liked about this space saving tables & chair set is the fact that it is extendable. When it is folded away, it is a nice square shape that would fit neatly in any corner. However, when you fold out the table extension, you can easily sit another two people which is perfect for those who entertain on a regular basis. The assembly of this dining set was relatively easy. Upon following the instructions we were able to assemble the entire set in a little over an hour with minimal tools and very little work. 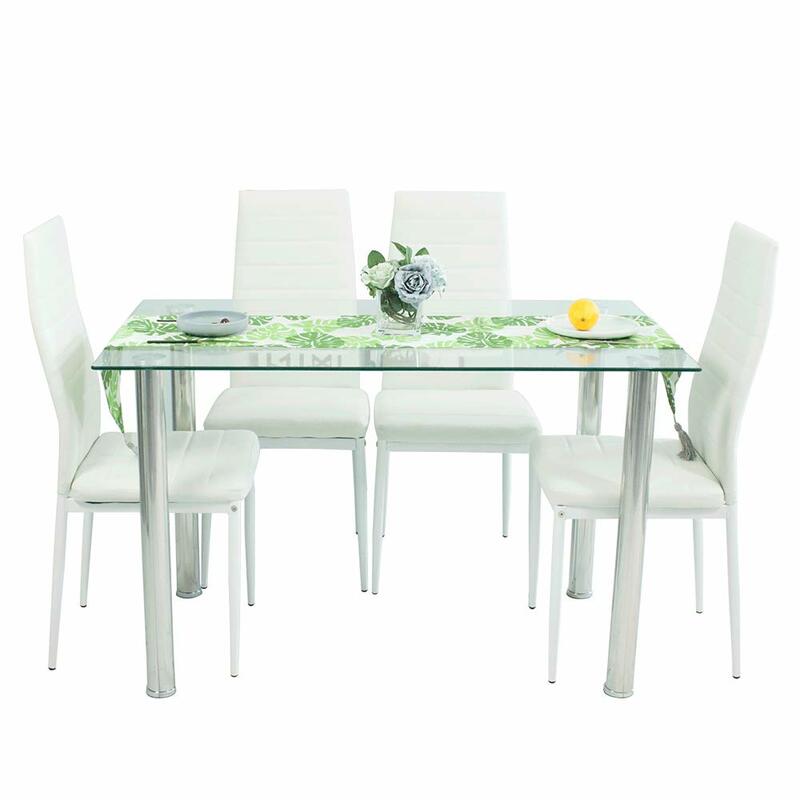 The chairs are very comfortable and fit neatly under the table and both the table and the chairs are very sturdy. The only issue that we did notice with this table is that whilst it is very easy to clean the surface with a damp cloth, the white plastic material is quite susceptible to stains, especially those made from coffee cups, so it would be a very good idea to invest in some coasters if you are going to be drinking at your table. Overall, this is a lovely modern design that doesn’t take up much space at all. A final plus point is that it is very lightweight, so it is easy to move it around if you need to. Very compact space saving table. Stools fit neatly underneath the table. Drawer available at the front for storage. Given that we know that some people have tiny amounts of space for dining, we thought that we would test out one of the smaller options and decided to take a closer look at the Charlton Home Snider Dining Table. This table is in a breakfast bar style and looks lovely; it would be perfect for both traditional and modern settings. 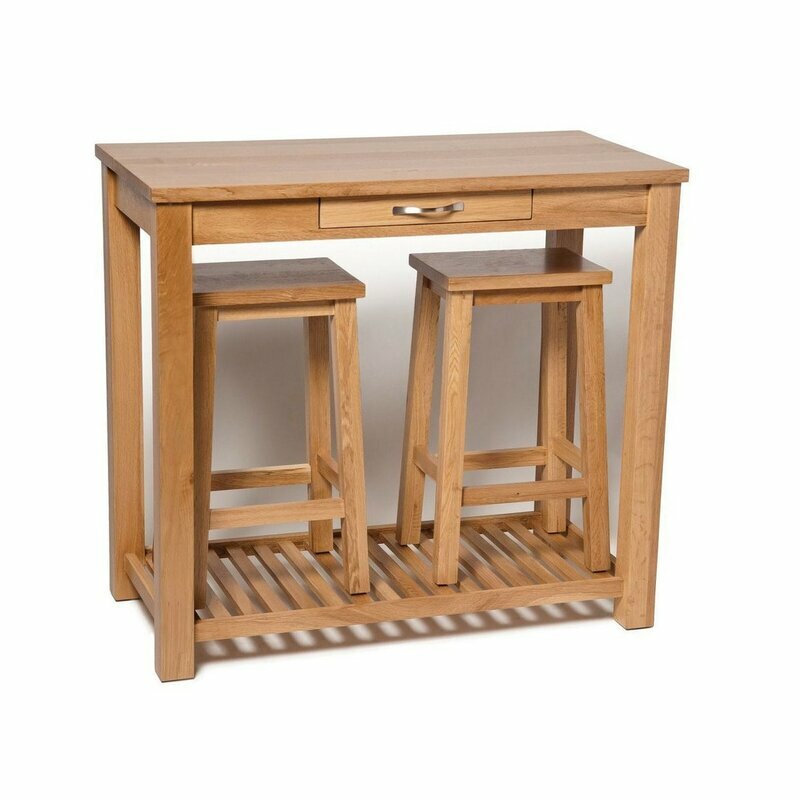 The colour of the table and chairs is light oak and the entire set is made out of oak and oak veneer which is highly durable. The table is solid and the stools are too; this is a dining set that has been designed to last for definite. There were a couple of nice touches that made us want to add this dining set to our list. First of all, there is the fact that the stools fit neatly underneath the table and really allow you to save huge amounts of space. The other thing that we liked was the drawer which is available at the front of the table. This is a very nice touch and is perfect for bills and other paperwork. 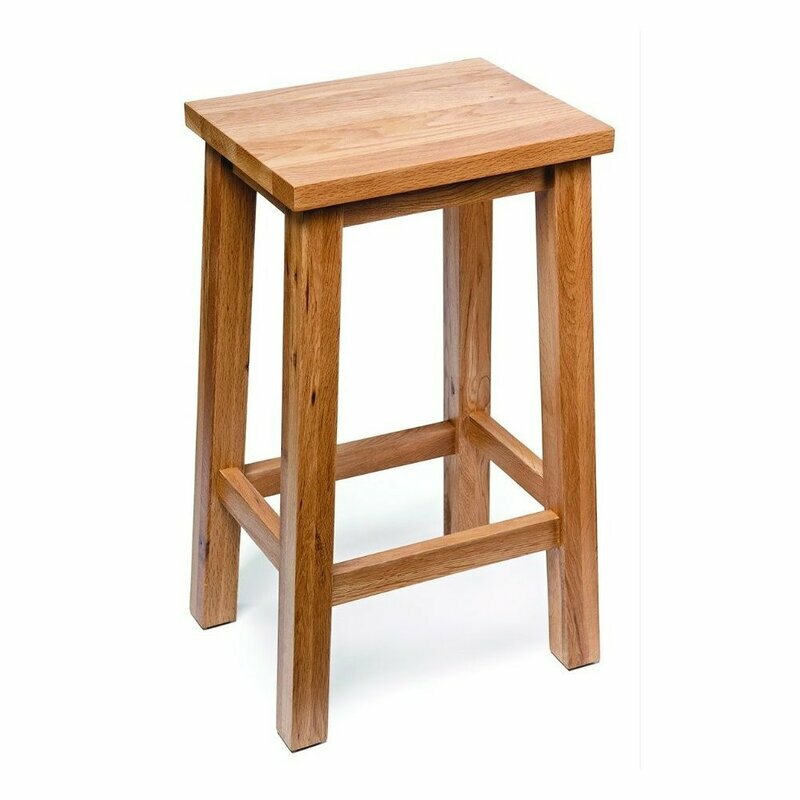 The only negative aspects are the fact that there are only 2 stools available with this set and it could be better for the price that you will be expected to pay. However, overall we felt that this was a very nice design. We hope that you now have a better idea of the perfect space saving dining set for your home.